In Memoriam - Seven Pearls Foundation, Inc.
​It is with deep regret and profound sadness that we inform you of the passing of Christine E. Trigg. 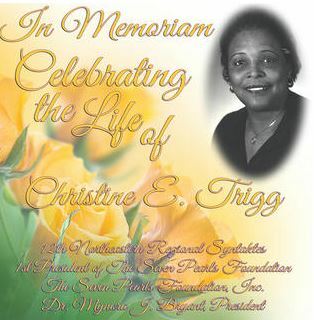 Soror Trigg was a woman of wisdom and integrity, setting a most historical, progressive, effective pace in her personal, professional and sorority endeavors. She was the first woman president of the New Jersey Council of Churches, the 12th Syntaktes (Regional Director) of the Northeastern Region of Sigma Gamma Rho Sorority, Inc., and the 1st President of the Seven Pearls Foundation, Inc. Her loving spirit and physical presence will be sorely missed, but her legacy will live on forever. The Seven Pearls Foundation extends its heartfelt condolences to Soror Trigg's family & friends during this difficult time. The Seven Pearls Foundation, Inc.